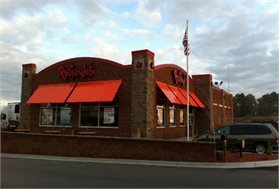 Goldsboro, NC Bojangles'® Tands, INC. Store #4 - Bojangles'® / Tands, Inc.
Hungry for something flavorful, fast and satisfying? Come to Bojangles’® in Goldsboro, NC! Our delicious Cajun fried chicken and made-from-scratch biscuits are always a hit. For breakfast, lunch or dinner, Goldsboro chooses Bojangles’®. It’s Bo Time! This Goldsboro location was remodeled in 2011 to have a newly sparkling and welcoming interior. We match that with friendly, fast service for all your Bojangles’® menu favorites. We are proud to serve patients and their families of the nearby Wayne Memorial Hospital. Wayne Community College students especially love the filling and affordable meals at our Goldsboro NC Bojangles’®! We are located right off of Hwy 70 for easy access.